Our version Pho at home! So what is Pho? It’s a Vietnamese noodle soup consisting of broth, ramen or linguine shaped noodles, a few herbs, and meat…..typically served with beef or chicken. The Best Bowl we’ve had so far was at Momofuku Noodle Bar on 1st Avenue in New York, NY. The absolute best!!! Can’t find one to compare… so we learned to make our own. Your bowl can be as protein or veggie packed as you like it! Pretty simple and quick post workout meal or just a warm filling meal on a cold night. We made this Thursday night after working 13 hours at the gym. Below is a quick camera phone video showing the prep. What did we put in our bowl? Chop onions, jalapeno, fresh ginger,bok choy, and all ingredients you love to your liking and sit aside. Boil a pot of water for noodles. Once the water is boiling hot, place noodles in pot. Cook the meat of your choice. Boil broth in small pot until hot. Once everything is cooked to your liking. Grab a boil and load it with every tasty ingredient you want. The fun thing is, every bowl can be different. Veggie Bowl, Meat Bowl…whatever you like. 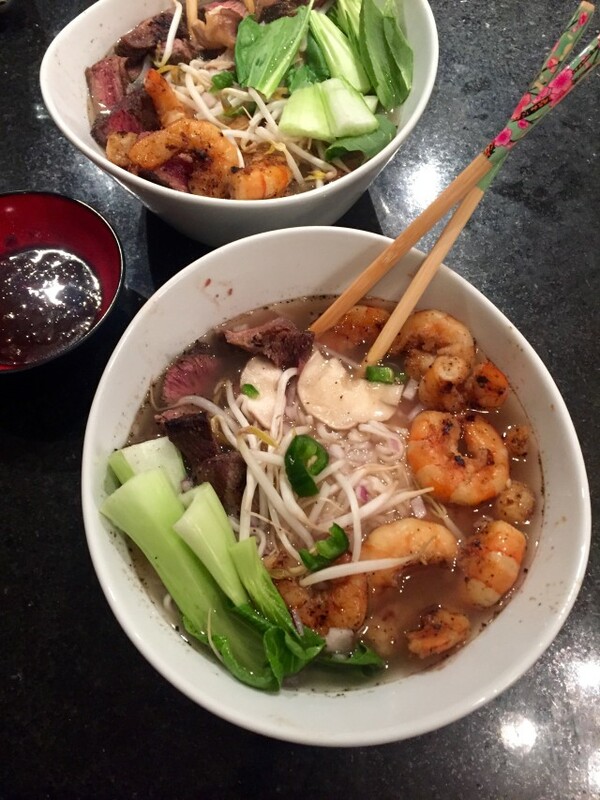 I have been craving pho for weeks now and I’m so happy you posted this recipe! It’s soo good! Simple and filling:) Enjoy!